The Greater Vasa Parrot (Coracopsis vasa) is one of the most unusual parrots in the world; and their popularity has grown amongst aviculturalists and the pet bird owners. The Greater Vasa Parrot is one of two species of vasa parrot, the other being the Lesser Vasa Parrot ,C. nigra. This parrot occurs naturally in portions of the Madagascar dry deciduous forests and surrouding islands in the western Indian Ocean. They were possibly introduced to Réunion. 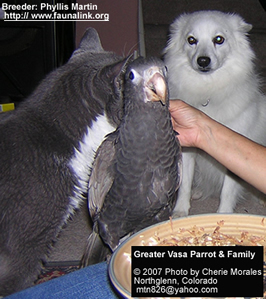 Greater Vasas are notable in the parrot world for their peculiar appearance, which includes extremely truncated bodies with long necks, and black to grey feathers. Their beaks range in coloration from a light cream to a dark brown with everything in between. They are approximately 20" (50 cm) long, with a wing length of 11.77 x 12.68 ins (299 - 322 mm). The plumage is generally a brownish black with a gray tinge to the wings. Immatures look like adults, but with more brownish plumage and a black iris. They have light colored eye rings which turn brown as they grow older. 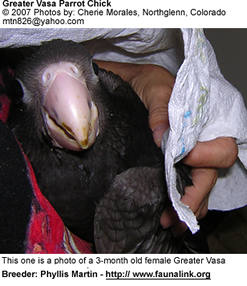 The beaks of immature vasas start out almost all cream to light brown, but is turning dark brown as they mature. 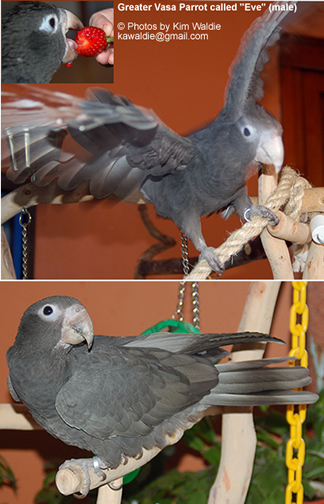 They are similar to the Black or Lesser Vasa Parrots (nigra), but have paler plumage. The breast and abdomen are more brownish, and the back more greyis..
Phyllis Martin and Kim Walde - from the Faunalink Foundation located in Plant City, Florida - are in contact with ornithologists in Madagascar who are working on having the Greater Vasa Parrot reclassified. They feel that the Vasa Parrot actually requires meat in their diet and are, therefore, being thought of as the genetic link between parrots and raptors; and that the Vasa Parrot - unlike other parrots -- hunt in the wild.